On the 6th day of Christmas Stampington gave to me...Art Quilting Studio and Sew Somerset!!! 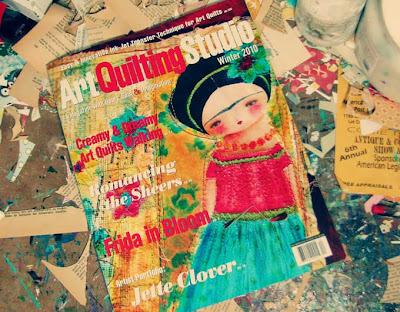 Art Quilting Studio...and I'm on the Cover!!!!! 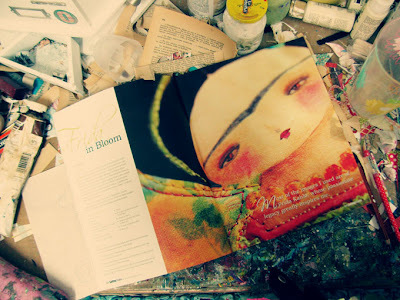 A while ago I made some art quilts for the magazine but I never ever dream about being on the cover... and when I saw it in the website I couldn't believe my eyes... so I wait until I got my magazine to share the great news! The other gift I got was Sew Somerset. 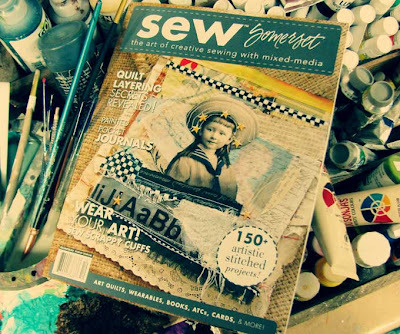 I love this magazine and as you know I love to incorporate stitches into my work. I have two articles here. 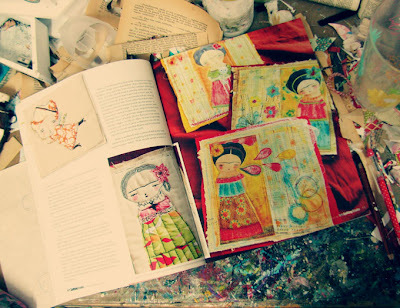 One is about free motion stitching on paper using ATC cards and fabric. And the other is about mixing free motion stitched collages with beeswax. I'm still jumping with joy! Wohooo!!!! Wow, you deserve it, Danita! I'm going broke buying all these magazines your in!!! Seriously though - I'm thrilled for you! You deserve it! Wow! Congratulations, Danita. 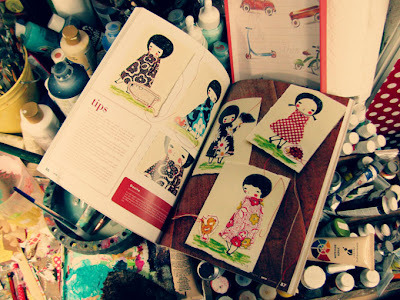 It seems that everyone is crazy about your incredible dollies and quilties and rightfully so. You are the queen of these amazing little girls - Frida and all. Way to go. I'm so happy for you. You deservie it. Congratulations Danita. She looks great on the magazine and you are so deserving of front page. Enjoy your week. Congrats...Way to go woot woot. P.S. I just ordered both magazines! Now I am jumping for joy! I can't wait to get them...! WOOOO HOOOO !!!! Congrats !!! I love your work !!! I can't wait to get to Barnes and Noble to check these magazines out! How wonderful for you to have made the cover, bravo! It's exciting to know your going to be published and then when you find out your on the cover too! How great is that! What a great gift. Congratulations Danita! How very exciting!!! 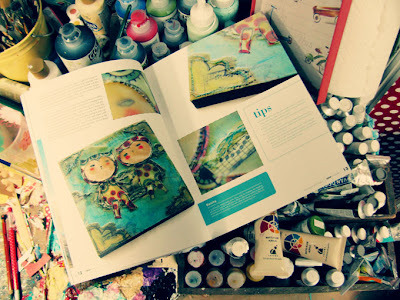 I just got my issue of Art Quilt Studio and I love it. I also love your work! It is truely an inspiration, much congrats on the cover! I saw these at the book store!! CONGRATS to you! congratulations, danita!! i'm so happy that you are on the cover. what a great honor. Oh!! Congrats!! That is awesome!!! I love Somersets magazines too, and sure can't wait to get to the store to buy this issues!! Keep up your wonderful work! You sure shine! Wow! congratulations!! It looks great!!!! Felicidades Danita. Quedan Muy bonitos tus diseños en la revista. Je viens de découvrir votre blog grâce à une amie. C'est vraiment merveilleux ce que vous faites. Et si vous imprimez vos dessins sur tissus, j'ai hâte de voir cela. I've admired your work in Stampington pubs and decided to check out your blog. I didn't realize how vast your range is! What fun! I love your work. Thanks for sharing it with us!